Make your house a beautiful home by installing hardwood flooring, one of the most sought-after surfacing solutions. Its timeless elegance and long lifespan guarantee to satisfy even the choosiest homeowners. Those shopping for new hardwood floors in the community look to our flooring store – the area’s leading provider of high-end flooring. At our store and showroom, we are proud to carry wood floors from the industry’s most reputable brands and manufacturers. 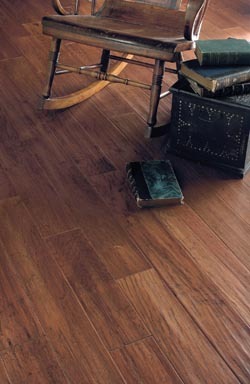 By utilizing the buying power of the Flooring America name, we deliver everyday low prices on quality products. Depend on our friendly team to help you through every step of the replacement process, from selection to installation! The key to long-lasting and beautiful hardwood floors is proper installation. When improperly installed, the wood planks may wobble, detach from the subflooring, or even warp. To avoid unwanted consequences like these, it is essential to use only the most experienced technicians to install your flooring. As a part of our commitment to client satisfaction, we maintain an in-house team of experienced installers equipped to skillfully complete any hardwood flooring installation. We are so confident in our work that all completed installations are backed by our Ultimate Confidence Guarantee. This guarantee states that if you are dissatisfied with your new flooring within 30 days of the initial install, we’ll replace it with a comparable product free of charge. Vast Selection of Solid Hardwood Also Available! Our large inventory of in-stock hardwood features some of the most well-known names in the flooring industry. Because of this, homeowners look to us for high-end floors that improve property value and appeal for years to come. With so many stains, finishes, and textures to choose from in our solid hardwood selection, finding the flooring of your dreams may seem like a challenge. Yet our in-store associates make shopping swift, easy, and even enjoyable. These knowledgeable flooring experts help you quickly peruse the countless materials on display at the showroom. By narrowing down the selection based on your expectations in appearance, performance, and price, they identify products most likely to satisfy. When you’re ready to make a purchase, our team provides free room measurements and installation estimates. To learn more about our selection of hardwood flooring, call today. Our store proudly serves the flooring needs of residents in Belmont, Laconia, Gilmanton, Wolfeboro, and Moultonborough, NH, plus all of the surrounding areas.